CMA organized an expert talk on Asset Allocation on 25 March 2017 at the Hotel Taj, Chandigarh. The talk was given by Mr. Prabhdeep S. Manocha, Senior Vice President and Regional Director, HSBC, Global Asset Management. Mr. Manocha explained that Asset allocation is an investment strategy that aims to balance risk and reward by apportioning a portfolio’s assets according to an individual’s goals, risk tolerance and investment horizon. The three main asset classes – equities, fixed-income, and cash and equivalents – have different levels of risk and return, so each will behave differently over time. Congratulations CMA Fraternity for becoming an ISO:9001 certified association because of the earnest efforts of Mr. Rohit Aggarwal. CMA organized a special induction program at The Hotel Taj, Chandigarh for its new members. 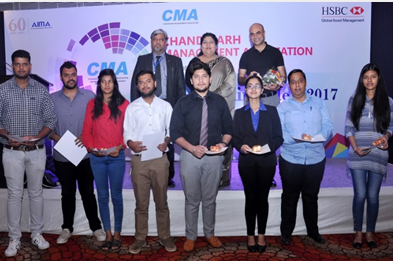 As many as 50 new members were inducted in the CMA’s induction program which was allotted membership number and given their membership certificates along with CMA’s souvenir – Tie Pins and Cufflinks.